I have exhausted all of my music collection and believe it or not, actually got tired of listening to talk radio. I was looking for an actual book at the library the other week and saw a section I had previously disregarded - The Book on Tape aisle. To tell you the honest truth you're not going to find gold in this section. You're not even going to find silver. At best you might find a bronze. If you're a fan of the crime novels; D is for Deceit, M is for Murder, C is for Cookie, then you're gonna eat that section up. I think of it this way, if I find a book that I consider a classic or modern classic I will buy and read the actual novel. There is something rewarding about tackling and completing a great book. But if I see a book on tape that I would probably never read or admit to reading, then it doesn't hurt to get it. So far my choices have been Duma Key by Stephen King, Emma by Jane Austen, and The Good Guy by Dean Koontz. Is it wrong that Dean Koontz is my guilty pleasure. His books aren't the smartest, most original, or deep by any stretch, but man I can really get sucked into them! He is the book equivalent to popcorn movies. If you do choose to read any Koontz, go for Velocity or the Odd Thomas series. The Good Guy is Tim Carrier. He is in the right place at the wrong time. While drinking it up at his buddy's bar a strange man sits next to him with a heavy envelope asking if Tim is "the guy." Tim plays along and this guy gives him the envelope and runs off. Tim looks in the envelope and there is $10,000 cash and a picture of a girl and address. Before Tim knows what to do, the actual hired hit-man sits next to him and asks for the envelope. Tim takes out the picture and the address and tells the guy to take the money and his assistance is no longer required. Wow, did I just write one of those enticing descriptions that are place on the inside of the book jacket? I think I did. Anyways, Tim finds the girl and the rest of the book becomes an exciting cat and mouse (mice) chase. The villain in the book is very cold. Nearly half of the book is told from his perspective and his pursuit. This is a good thing for the pacing of the book to remain quick. You would almost like this "big bad" if it weren't that he was kind of a freak. The main character Tim is likable but sadly you never quite feel anything towards the girl he's trying to save. Koontz's writing style is very quick. Though he has this weird knack of going into deep description about the age of wood or the color of the sky at the beginning of every chapter. After embellishing he gets right back into the simple action. At only 8 discs, it doesn't take much time at all to listen to The Good Guy. That is, when compared to Emma's 15 discs which felt like an eternity. Though let's be honest, anything to do with Jane Austen feels like torment. 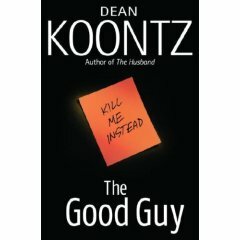 The audio-book for The Good Guy is a good listen, maybe even a good book. Imagine if Koontz had called it The Great Guy. This "Book on Tape CD" deserves an average score of 3 stars.